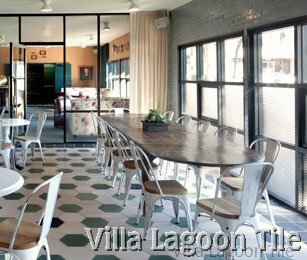 For hotelier Avi Brosh’s newest addition to his Paligroup collection, Palihotel Melrose Avenue, he knew he had found the perfect location in the former 1960s senior living residence-turned-hostel. 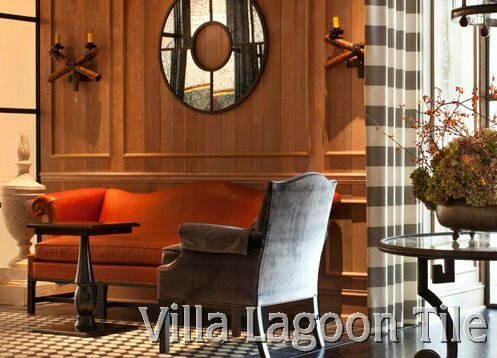 The hotel is infused with “a combination of custom-made pieces and vintage finds. Watch for a feature on the Pali Group in the July 2012 issue of New American Luxury Magazine. 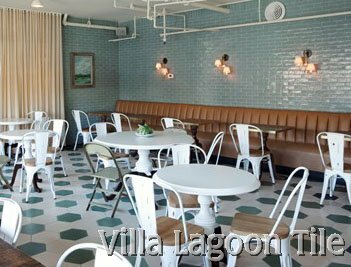 We furnished the hexagonal cement tile for the Pali Group's Pali Hotel , Melrose. 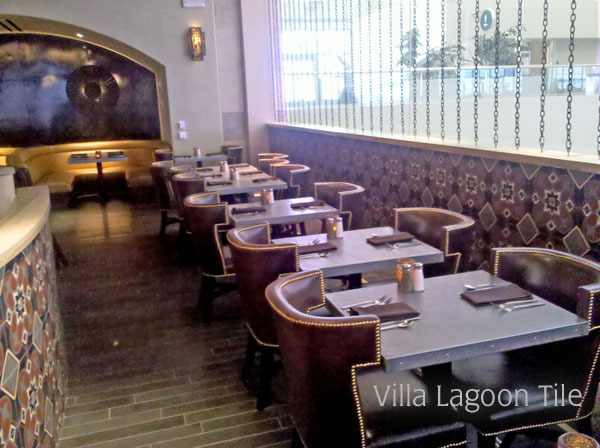 Los Angeles new Pali Hotel Dining Area with our Hex tile. 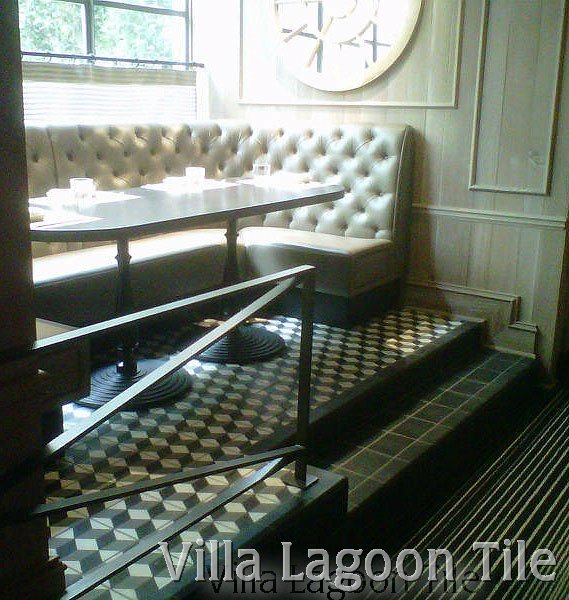 We have our tiles in many restaurants but getting photos is always a challange. 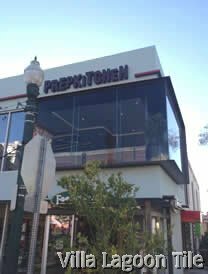 We especially appreciate that a PrepKitchen employee, Aaron, took these photos and emailed them to us. Thanks Aaron Z. 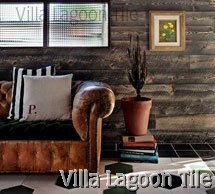 We think the two color tile (mint green and chocolate brown) is an economical and striking contrast to the handsome striped wood floor. 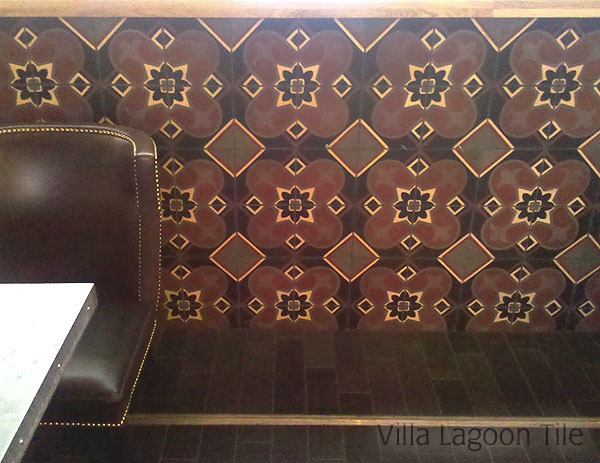 We so seldome see cement tiles on walls in the USA that we are thrilled to see them here. FYI-Cement tile are frequently used on walls outside the USA. 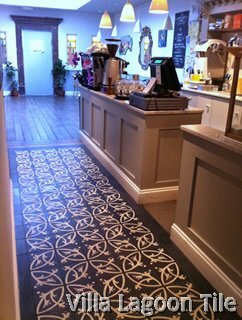 This pattern is available from two of our tile fabricators. Click photos below for larger images. 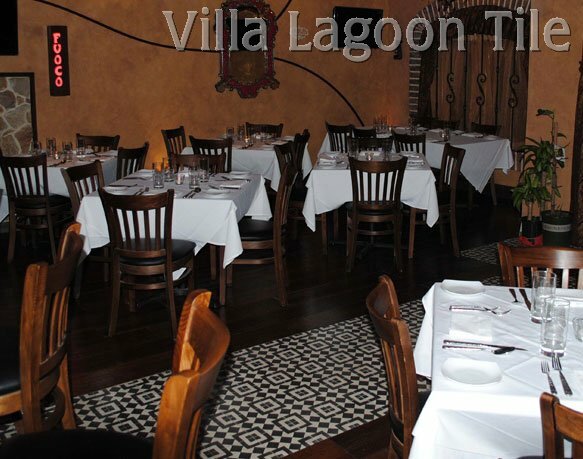 The chain of Gringos Restaurants in the Houston area are extremely popular. The decor is a lively mix of colors and textures. They have several of our patterns in the new Cypress location. 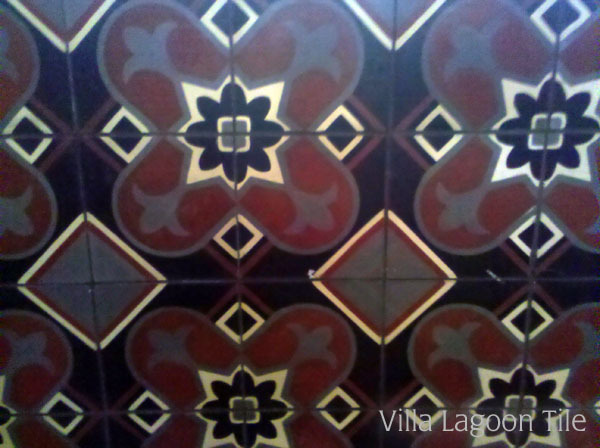 Click here to see the Gringo's tile photos. 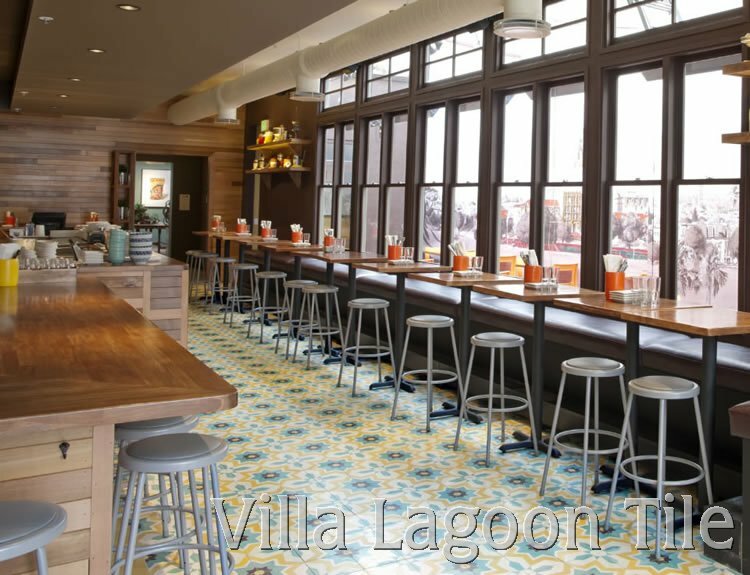 The popular eatery, Tacolicious Restaurant in San Francisco, ordered a custom tile for their new location. The owners visited the family home of one of their Mexican employees and were so smitten with the patterned cement tile they saw that they ordered a similar tile for the new restaurant. 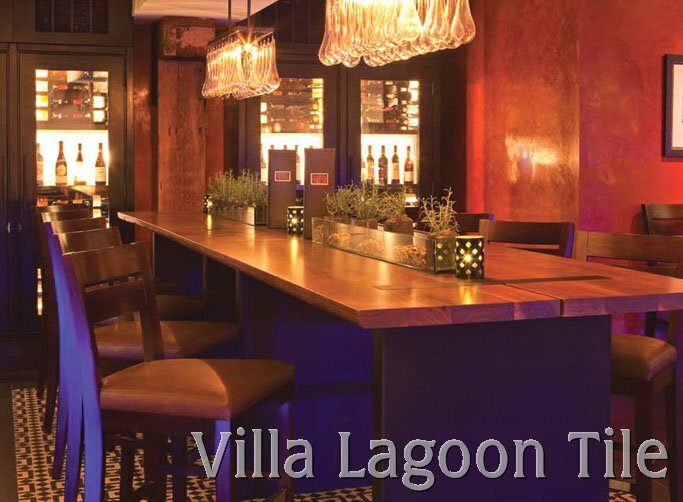 We worked with owners, Sara and Joe, and designers at Tim Murphy Design Associates, to achieve just the colors and design they wanted. Joe and his dad laid the tile. Check it out in person, 741 Valencia St., between 18th and 19th., San Francisco. 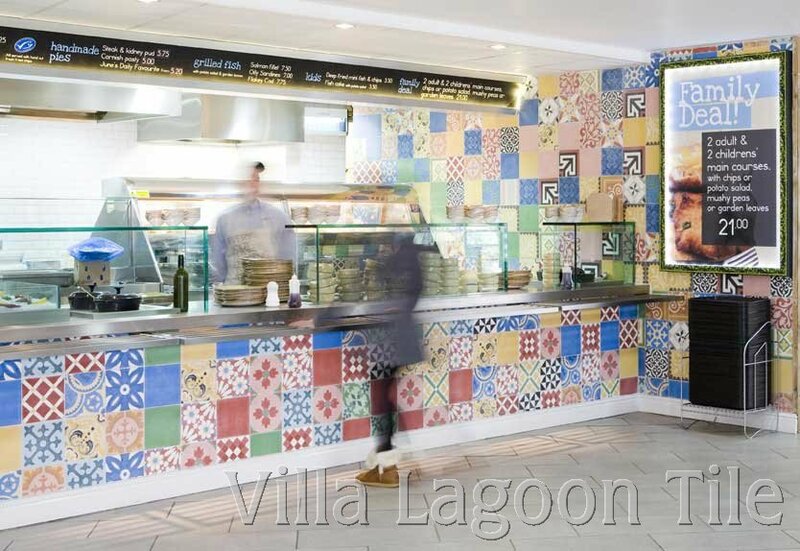 The Chester Zoo in the UK wanted a fresh, cheerful look for the Fish & Chips shop in the food court. Our European/ UK Patchwork is a great choice. The design team was Keane Brands of UK. Now everybody loves feeding time at the zoo ! 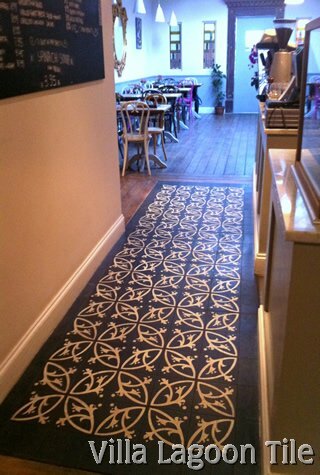 Islington N1 1RG, you can stop by for delicious food and check out out tile. 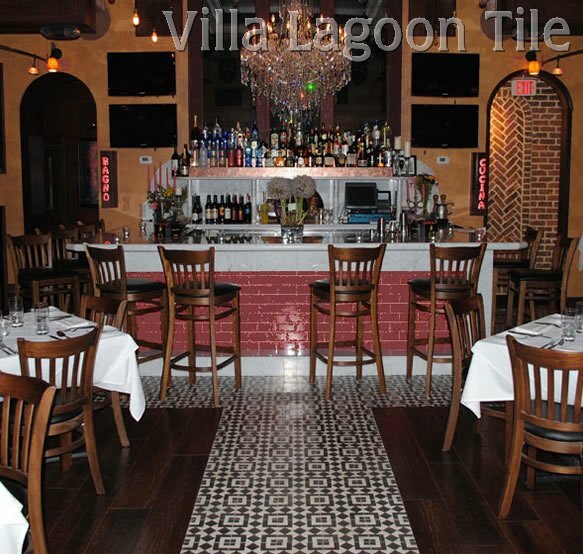 Sent by the owner: "Serata Restaurant Long Island New York Designer Antony Gironta, Marakesh Tile for your use … we are doing a Serata 2 and using more of the same !!!!!!!!" The Federalist Restaurant - Washington, D.C. 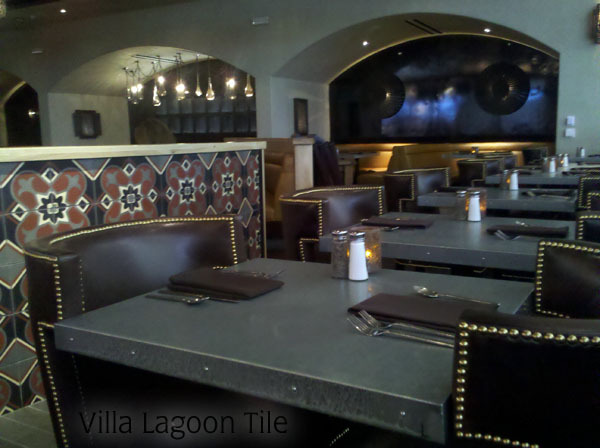 The Federalist Restaurant at the Madison Hotel in Washington D.C.
La Bella Vita Restaurant in Maine's Sanoset Resort with our Marrakesh tile pattern in Black and White. 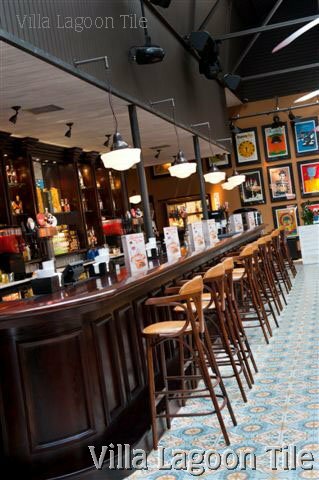 We have a close relationship with a chain of restaurant/bars in the UK who use our tiles frequently. Here are shots from four loacations. 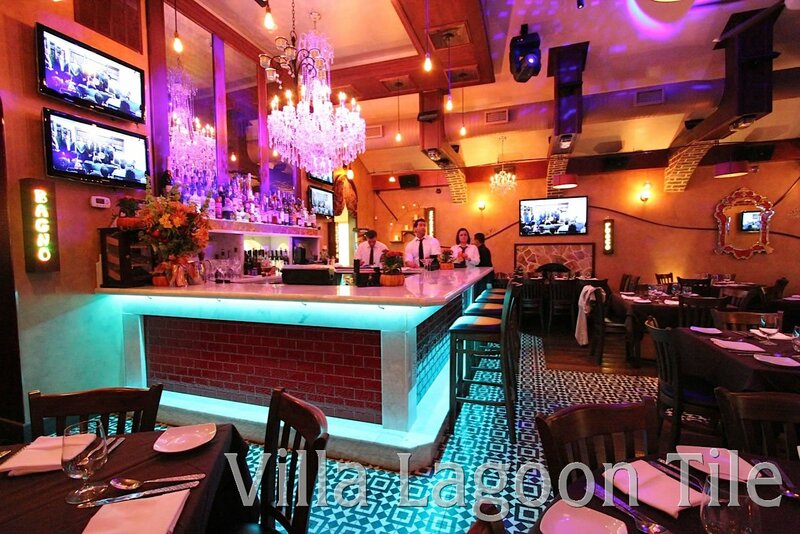 Our Havana Cantina is fabulous in this UK restaurant / bar. A pattern like this looks good until the evening's end...crumbs and such just do not show. 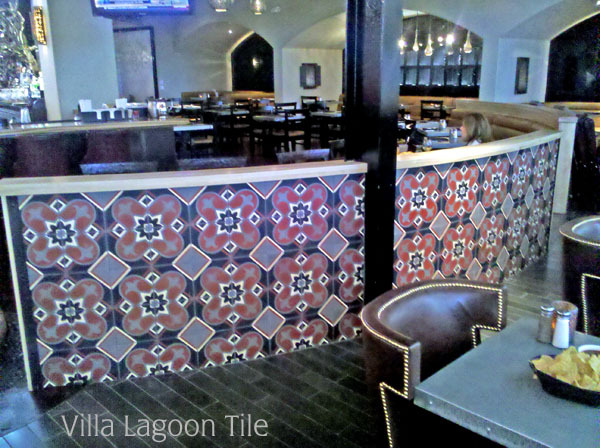 Thanks to Adam Rankin we have photos of a custom tile in Javi's Restaurant in the Delta Terminal at John Wayne Airport in Santa Monica, Calif. Our tile was used on the walls in select areas of Javi's wich is a spin-off of the popular Javier's Restaurant locations.